Researchers have long been interested in fast-running robots with powerful, agile legs. In particular, several groups have focused on bio-inspired designs based on cheetahs. 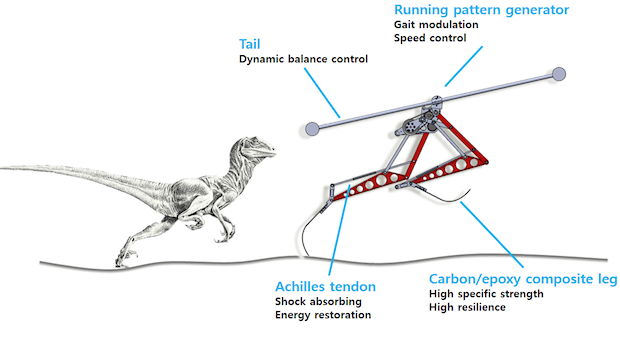 But when a team at the Korea Advanced Institute of Science and Technology (KAIST) set out to create a new sprinting robot, they didn’t look at big cats; instead, they found inspiration in a completely different kind of creature: a velociraptor. The robot, called Raptor, has two nimble legs and a mechanism that mimics a tail. In a recent experiment, it achieved an impressive speed of 46 kilometers per hour on a treadmill. That’s faster than the fastest human, the Olympic sprinter Usain Bolt, whose top speed has been estimated at 43.92 km/h. And it’s almost as fast as the world’s fastest legged robot, Cheetah, built by Boston Dynamics, which reached 47 km/h in a trial two years ago, also on a treadmill. But before you suggest a robot race between the two machines, note that both Raptor and Cheetah are attached to beams that keep them steady and prevent them from running off the treadmill–and crashing through a wall. And despite their similar speeds, the two robots are very different. Cheetah is a hefty quadruped, powered by hydraulic actuators. Raptor is a compact, 3-kilogram machine, with two legs made of lightweight composite material. Another difference is that Raptor has a tail. Although it looks nothing like a Velociraptor’s tail, it works like one, moving rapidly to help the robot maintain its body stable while stepping over obstacles, says Jongwon Park, a PhD student at KAIST’s Mechatronics, Systems, and Control Laboratory. Park developed Raptor along with colleagues Jinyi Lee, Jinwoo Lee, Kyung-Soo Kim, and Professor Soohyun Kim. A recent video of Raptor shows the robot progressively increasing its speed until it reaches the 46 km/h mark. The video also shows a researcher placing obstacles on the treadmill. Thanks to its tail, Raptor doesn’t trip on them. Using a tail for stability is not a new idea in robotics. MIT’s cheetah-inspired quadruped has a mechanical tail, and a UC Berkeley wheeled robot features a tail that is also based on a velociraptor’s. Raptor is not the first robot to sport legs with prosthetic blades, either. Another biped running robot, Athlete, built several years ago, also used carbon-fiber running blades. Still, Raptor stands out for its simplicity, showing that it’s possible to achieve significant speeds with an uncomplicated design. Unlike other legged robots that rely on multiple actuators, Raptor uses just one motor per leg, which consists of a nine-bar linkage. To recover part of the energy used to make the robot move, the researchers added Achilles tendons that work as springs, absorbing and restoring energy with every step. The robot’s control system is also simple. Raptor runs a computer program known as a running pattern generator, which controls gait and speed. The KAIST team is currently working to optimize their robot. They’re interested not only in achieving ever-greater speeds, but also improving control and stability. 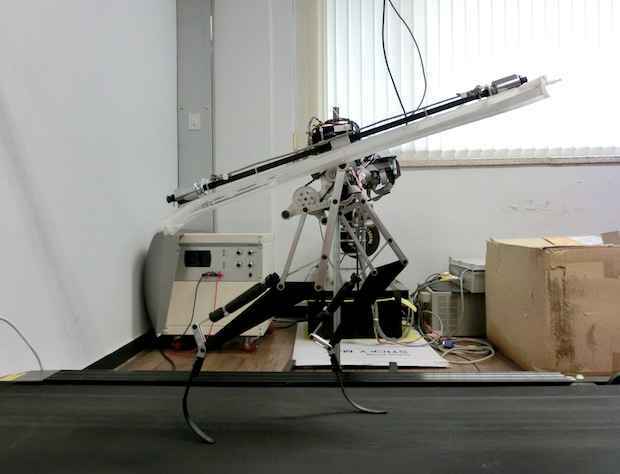 We’ve seen other legged robots take their first steps on treadmills and then learn to walk outside the lab. One example is HyQ, a quadruped from Italy. And then, of course, there’s Boston Dynamics’ WildCat (the successor to Cheetah), which was seen in a video bounding and galloping in a parking lot. We hope the Korean researchers can build a version of Raptor that doesn’t need a treadmill and that they can set free outdoors. And then we can have a robot race.